Odds are you weigh more than you did 20 years ago. Most of us do. And not only has your waistline grown, but your ideal weight has increased, too. In a recent Gallup poll, 60% described their weight as just about right. That's just about the same percentage of Americans who are overweight or obese. What’s the truth about your “happy weight” and your healthy weight? Are they closer than you think? Or further apart than ever? The idea that being overweight isn’t unhealthy got a turbo-charge in 2013. That’s when a study in The Journal of the American Medical Association reported that people who were up to 30 pounds overweight were less likely to die early than people at a normal weight. A close investigation revealed major flaws in the study's methods, though. Turns out, our happy weight isn't so healthy after all. What's more, decades of research show that obesity leads to many serious health problems. These extra pounds make you more likely to get a wide range of diseases, from diabetes and high blood pressure to dementia and some kinds of cancer. Going up just a single skirt size over any decade between your mid 20s and mid 50s, for example, makes you a third more likely to have breast cancer after menopause. The health problems tied to obesity, especially chronic diseases like diabetes, can have a long-term impact. "These are diseases you have to manage not just for a few months, but for a lifetime,” says dietitian Rachel Brandeis. “They impact your health, your wallet, and your day-to-day activities. You spend more time at the doctor’s office and more money on medication. You’re always trying to manage your disease and feel better." What's at stake, she says, is your quality of life. Still, many of us have a hard time facing our weight. Brandeis says most people are "shocked" when they step on the scales. 1. Know your BMI and waist size. 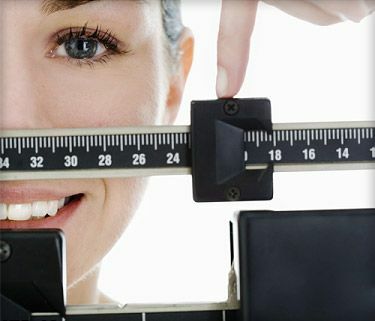 Your body mass index (BMI) is based on your height and weight. It’s a good tool to help measure body fat – and gauge your chances of disease. But it isn’t foolproof. If you're muscular, the BMI can overstate your body fat. If you're older and have less muscle mass, it can understate your body fat. BMI is just a guess at the link between your weight and health, says Sally Stieghan, a registered nurse and dietitian from Atlanta. Your waist size can give a better picture of your health – especially if you’re muscular. Simply take a tape measure and put it around your waist, right above your belly button. If your waist size is over 35 inches (for a woman) or 40 inches (for a man), it's time to take some action. 2. Forget your ideal weight. Some doctors don’t even like to talk about ideal weight. That’s because it can often seem too hard to reach. The fact is, even small amounts of weight loss are healthy. Instead of focusing on that ideal weight, Brandeis says to aim low. A 7% to 10% weight loss makes a huge impact on your metabolism, she says. Once you reach that goal, the next 10% seems much easier. Small changes are more likely to become permanent and, over time, have big impacts, Stieghan agrees. 3. It's never too late. As you get older, your muscle mass shrinks. But you can boost lean muscle mass and keep your body fat down, even in your 80s, studies show. You’ll also have better balance and stability, which will help prevent broken bones. British Medical Journal, Aug. 21, 2014. Flegal, K. The Journal of the American Medical Association, Jan. 2, 2013. Sally Stieghan, RD, LD, Atlanta.